This is a representative sample of the tin toys in my collection. Most of the older pieces are from Japan, with the exception of the noise makers, many of which were made in the good old U.S.A. 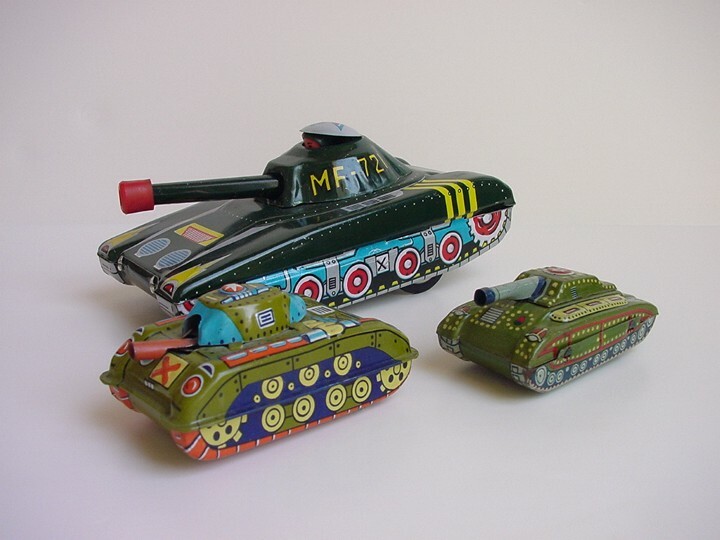 Although most modern tin toys are made in China, many are still made in Japan and also the Eastern Bloc. Japanese tin is the most prized . . . and of course, the most expensive. 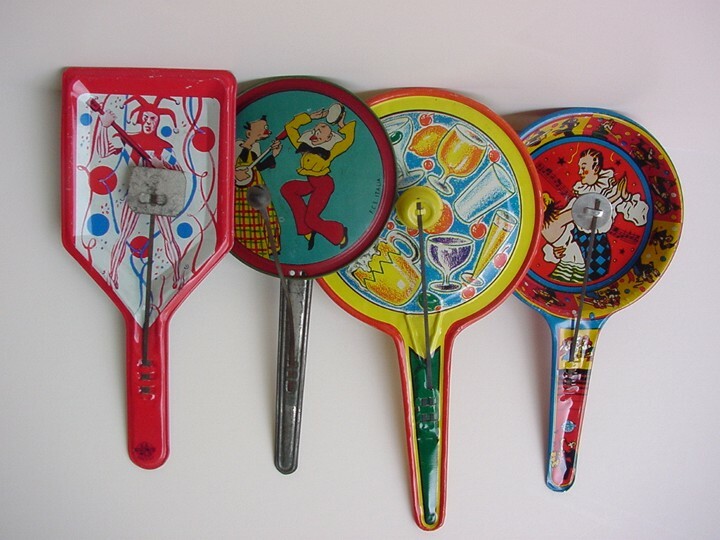 Lithographed tinplate noisemakers that make a clacking sound as you twirl them. 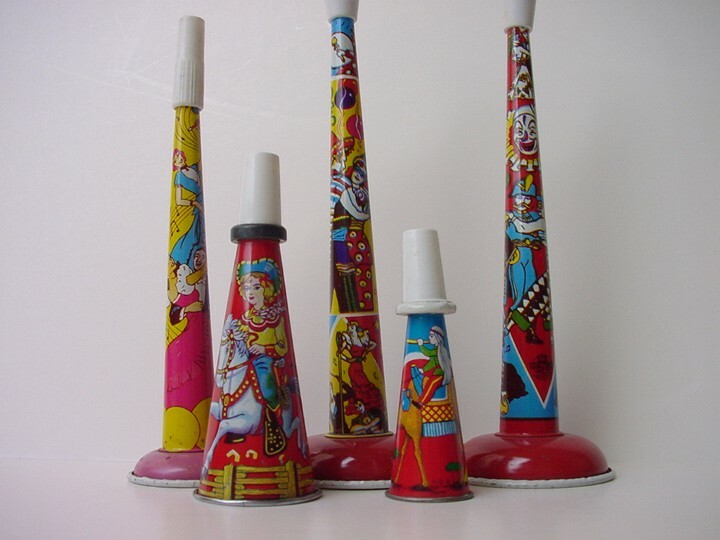 Lithographed tinplate noisemakers that make a clacking sound as you twist the handle or twirl them. 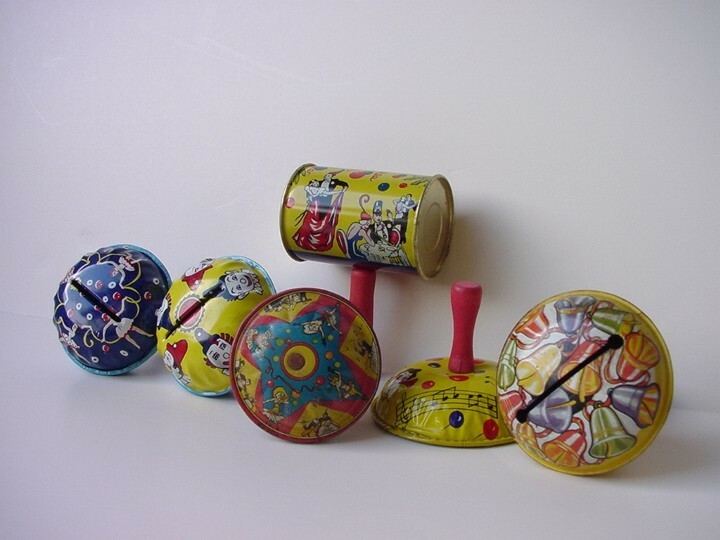 Lithographed tinplate noisemakers that make a clanging sound as you shake them back and forth. 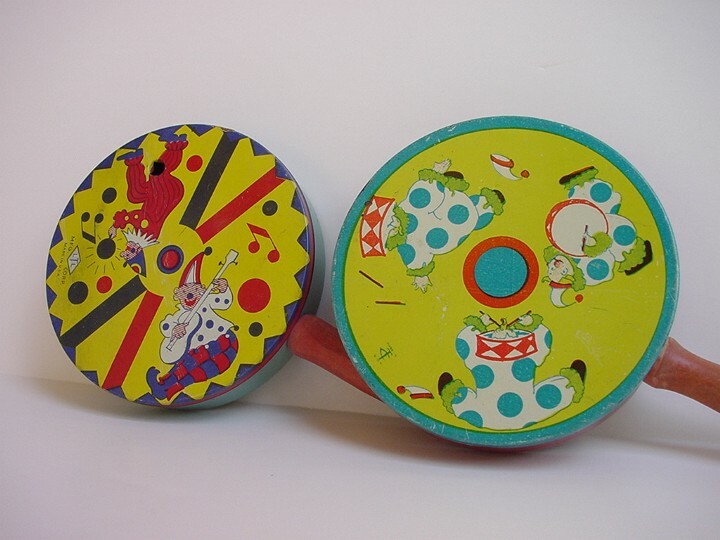 Lithographed tinplate noisemakers that make a loud rattle as you shake them. 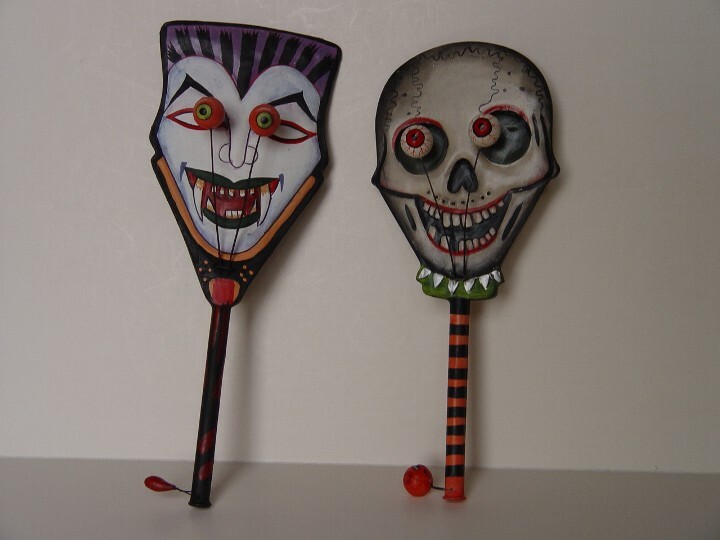 Lithographed tinplate noisemakers that rattle when shaken. 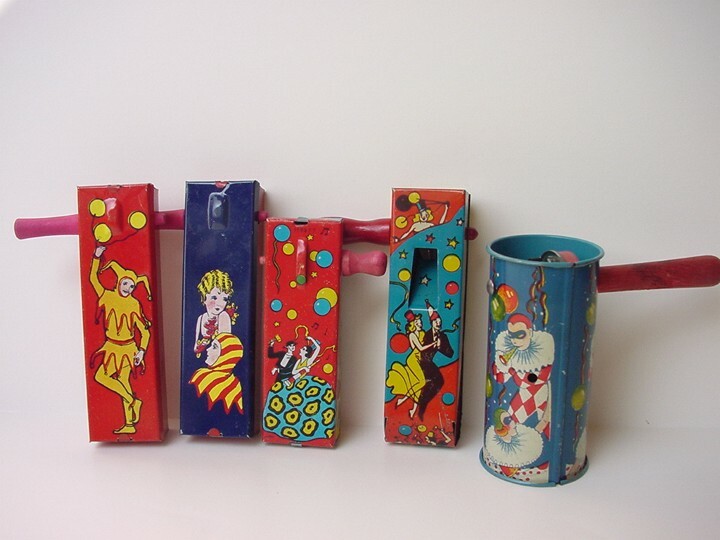 Lithographed tinplate noisemakers that make a clicking sound when the bottom lever is pressed. Lithographed tinplate dart pistol with rubber tipped suction darts. Lithographed tinplate crank machine gun with 10 bullet clip. 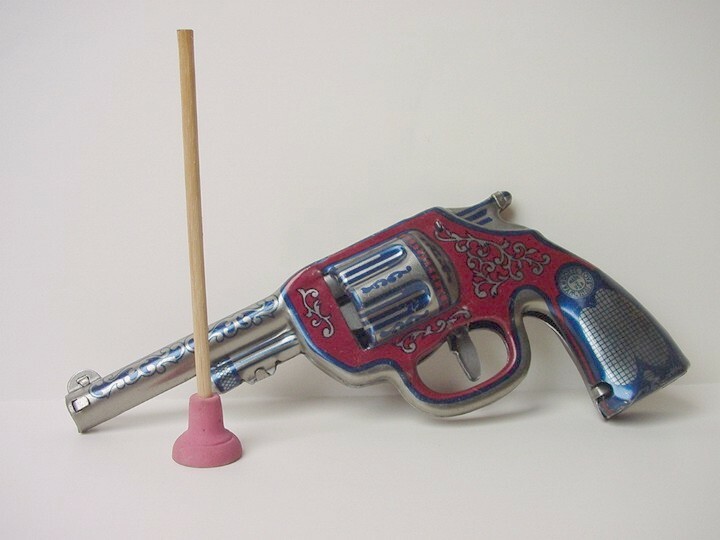 Fires plastic bullets & makes a bang sound as you turn the crank. 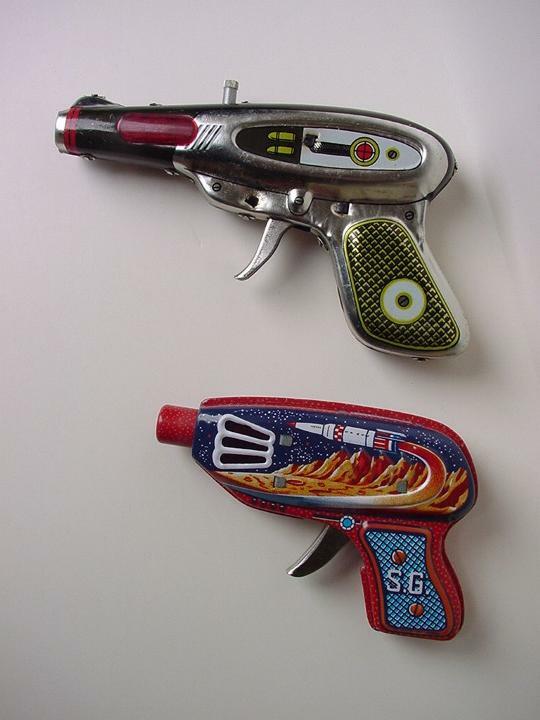 Lithographed tinplate space guns with sparks & noise. The silver one has a tube on the top to enable you to replace the flint. Lithographed tinplate: Small - friction motor, Med - push with sparks at gun, Large - friction motor with moving gun and hatch. Lithographed tinplate planes and choppers with friction motors. Blades spin on the choppers. 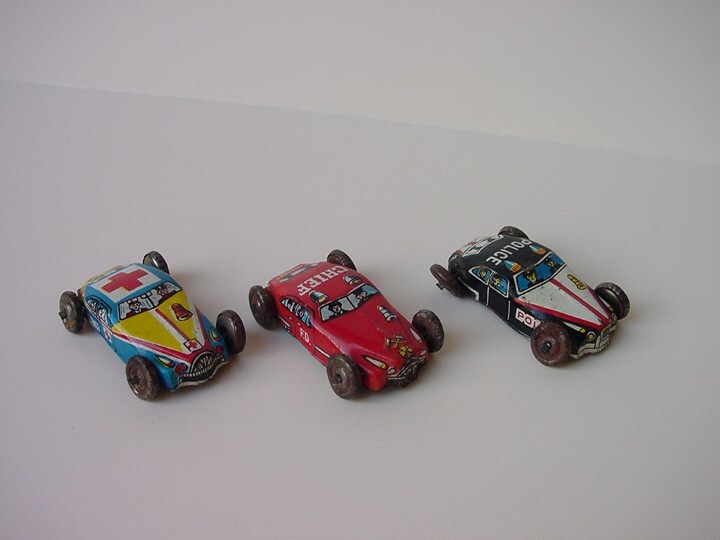 Lithographed tinplate battery powered cars that move to the edge of a table then turn around and go to the next edge, etc. Lithographed stamped steel cars - ambulance, fire chief and police. Lithographed tinplate steamroller wind-up with a back and forth movement. 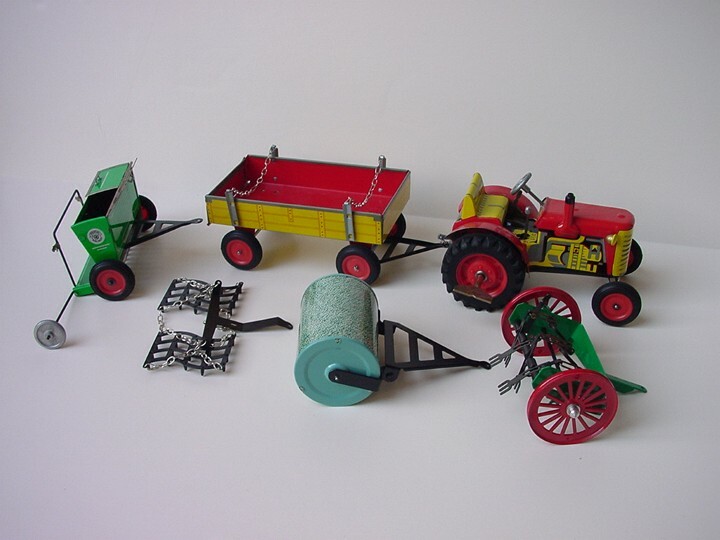 Lithographed tinplate wind-up tractor with trailer and other farm accessories. 3 forward speeds and reverse. 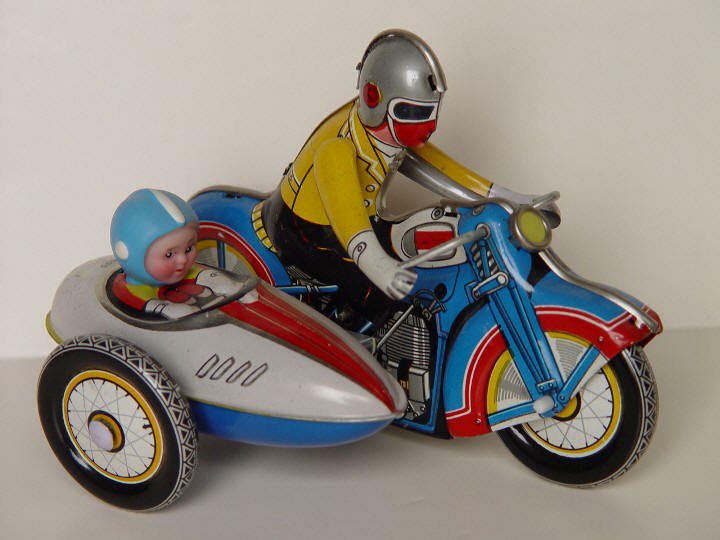 Lithographed tinplate windup motorcycle with sidecar. Goes in a circle. Lithographed tinplate rockets w/friction motors. Standing rocket moves forward until it hits an object with it's noise, than an arm is released that causes it to stand up . . . very cool. 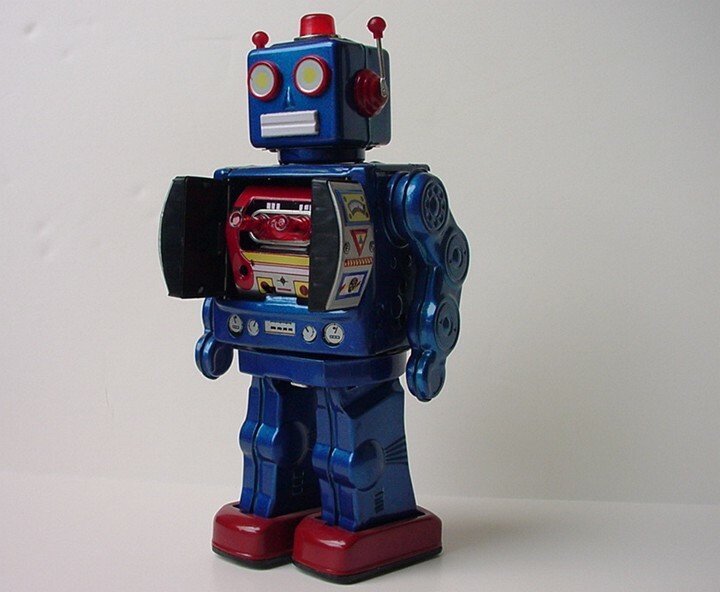 Lithographed tinplate battery powered Robot. He walks, body rotates, chest doors open and guns fire and spark. 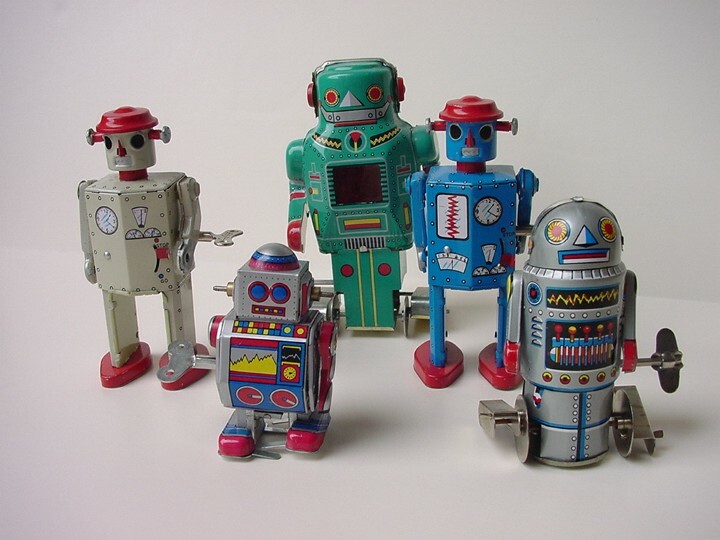 Lithographed tinplate wind-up robots. All walk and the large green one also sparks. Lithographed tinplate wind-up robot walks and arms swing. On-Off switch on the back. Reproduction of the first wind-up robot built in the 40's in Japan. Painted tinplate crank music box. 1962 Rosko battery operated Charlie Weaver bartender. Shakes, pours & drinks then his ears smoke. 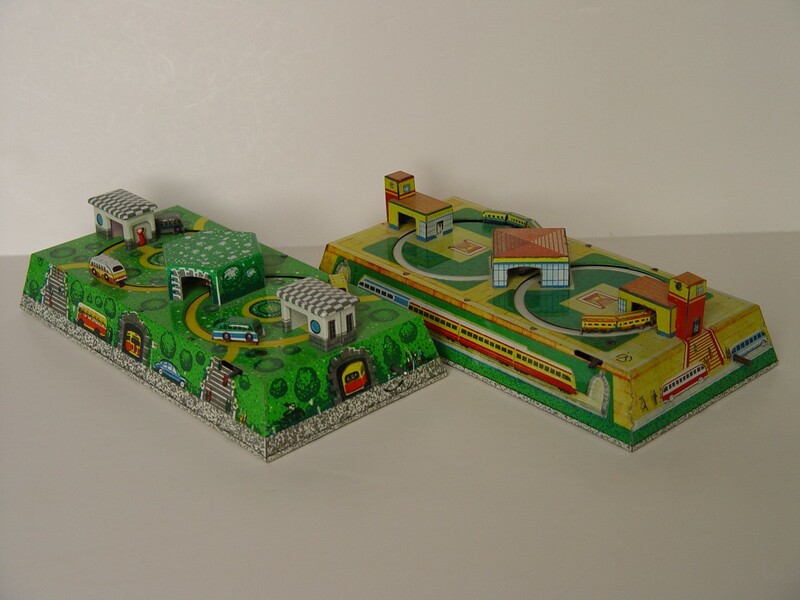 Lithographed tinplate toys. Friction Dog - you push down on the tail and he rolls forward. The windup Duck on a Bike goes in circles as the wings of his hat spin. 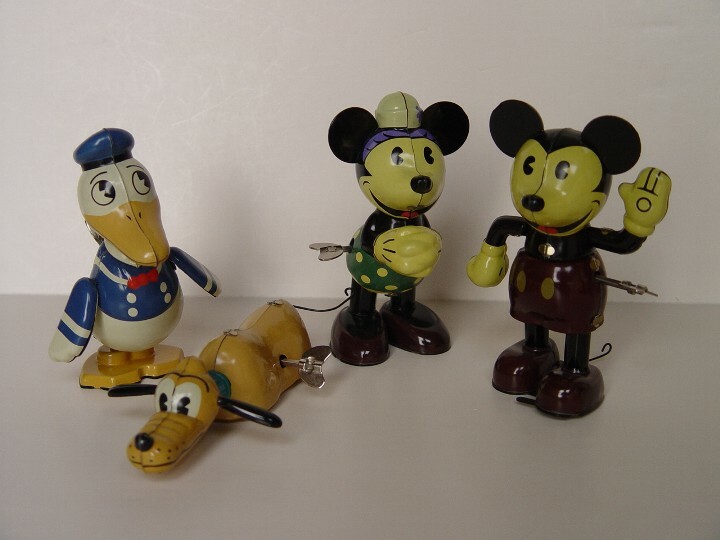 Lithographed tinplate windup Mini, Mickey, Donald and Pluto. Mickey walks and moves his upper body left & right, Mini hops forward, Donald waddles left & right and Pluto rolls forward and moves his head left and right. 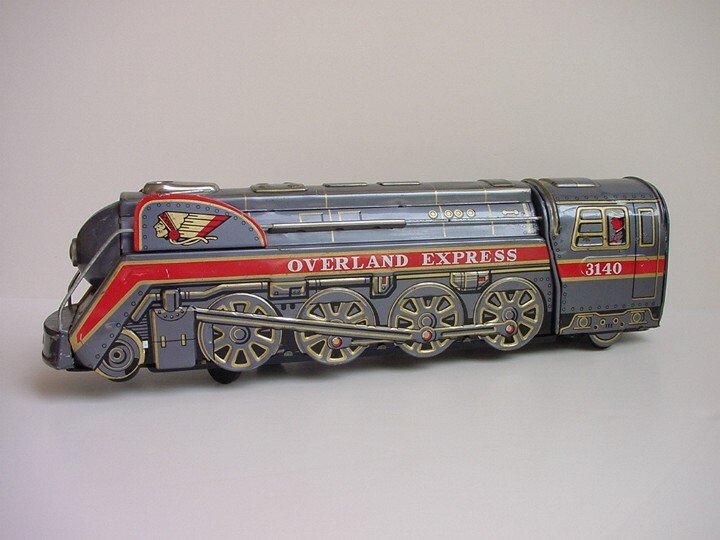 Lithographed tinplate version of a 1920's toy called the San Francisco Express. 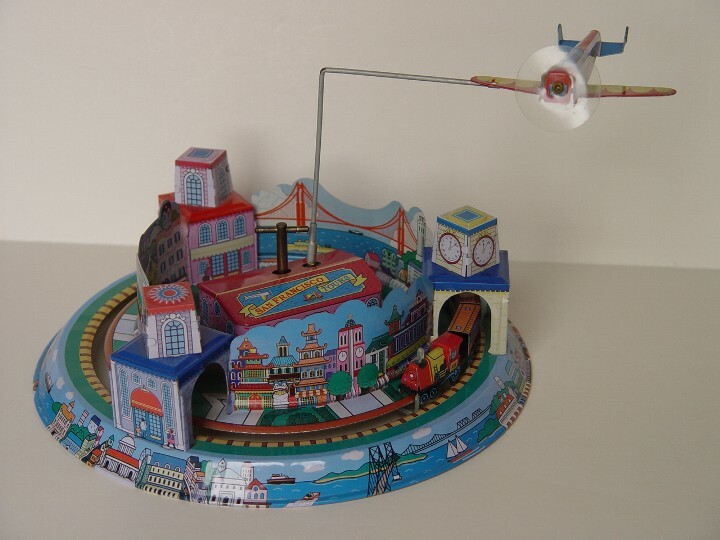 The Plane and train circle the city. 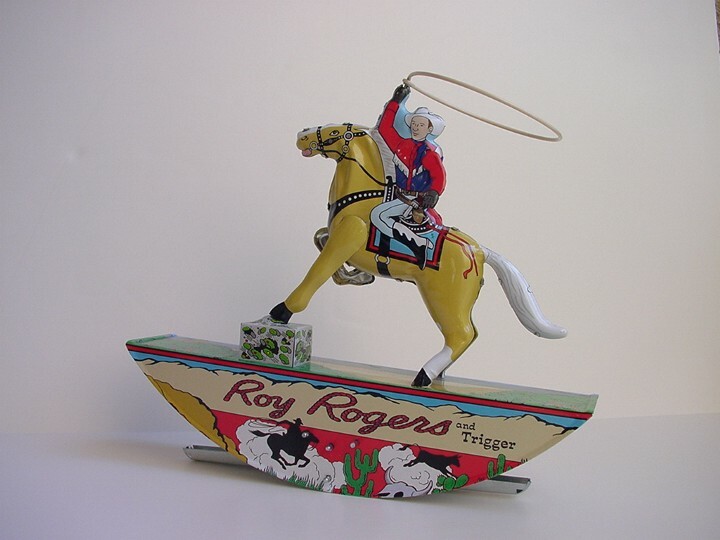 Lithographed tinplate windup of Roy & Trigger with rocking action causing the rope to swing in a circle. #4,969 of 5,000. 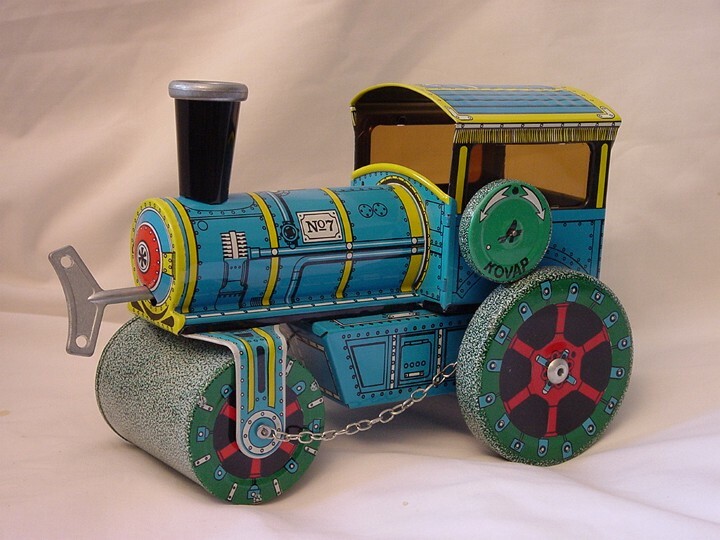 Lithographed tin was introduced to toys in the 1880's whereby various colors and detail were printed on flat sheets of metal by a lithographic press; the various pieces were then formed by dies and assembled with small tabs. 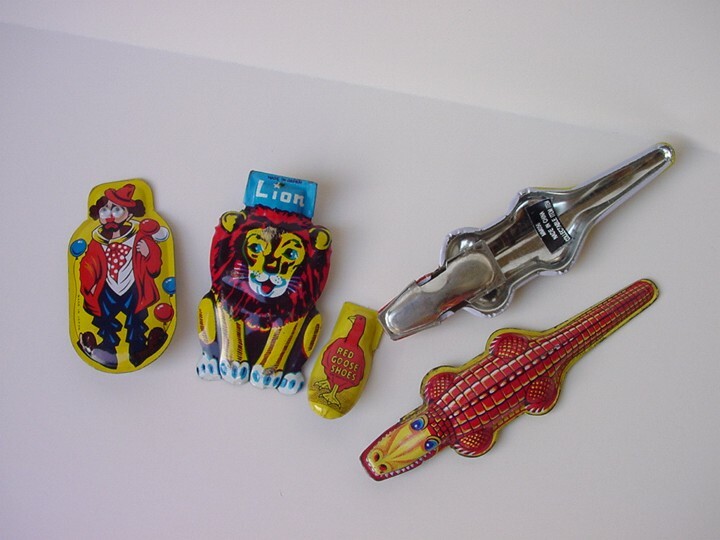 The sheet metal for tin toys and noise makers is made of steel that is rolled into thin flat sheets or plates. 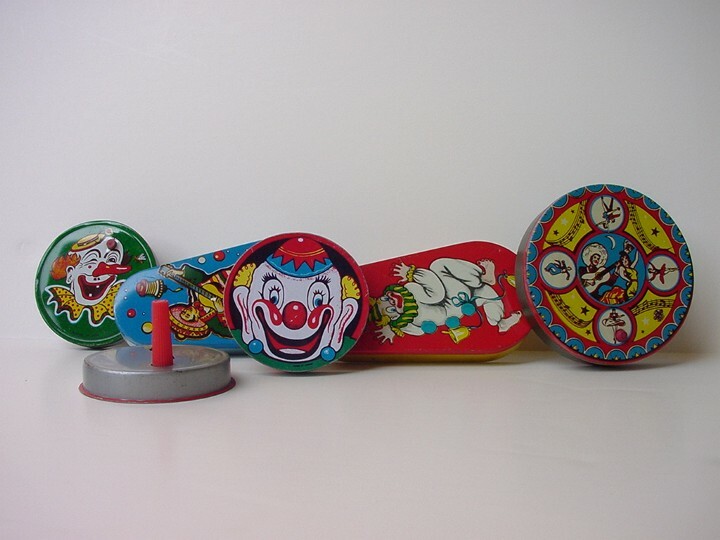 First toy usage for tin plate in the United States dates back to 1895. 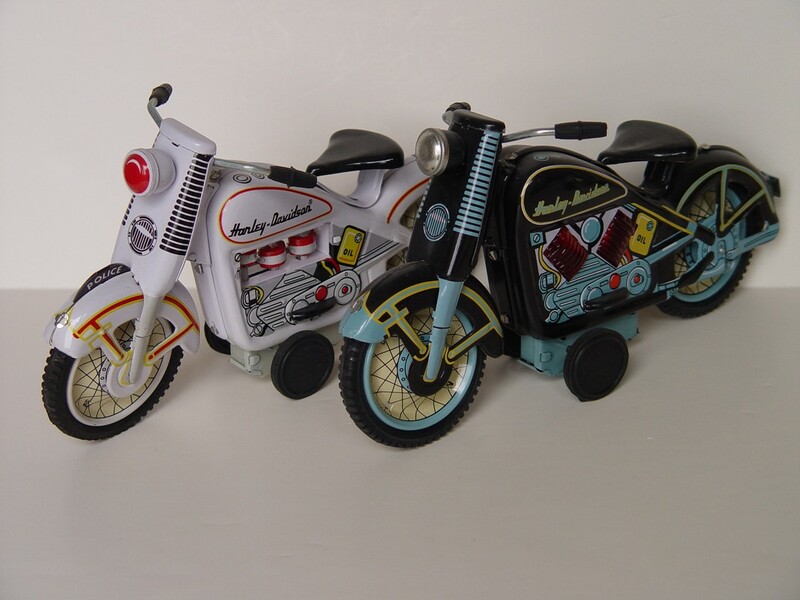 In the early decades of the 20th century, Germany was the leading producer of tin toys in the world. 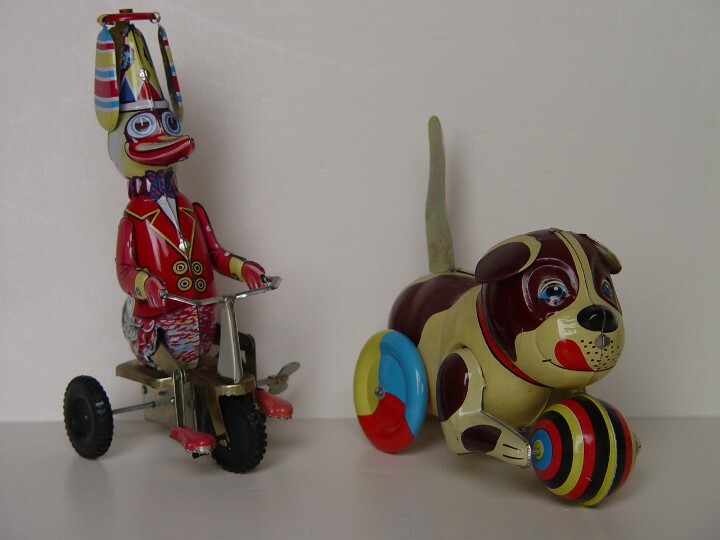 German tin toys were innovative and well made. They dominated the market up to the outbreak of World War II. 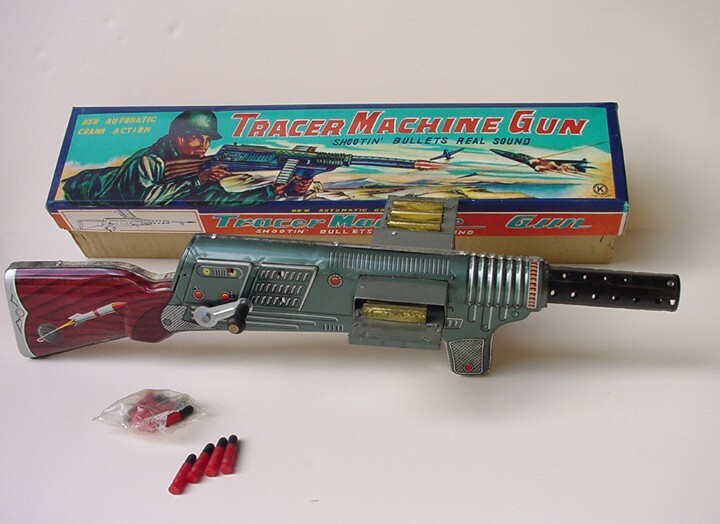 When peace returned, toy makers everywhere had a great deal of lost ground to recover. However, once the toy industry was back in full production, Japan assumed the lead and began to control the market with the addition of many new novelties. Not just wind-up and friction driven, some Japanese tin toys were powered by batteries and able to provide flashing lights and sounds. 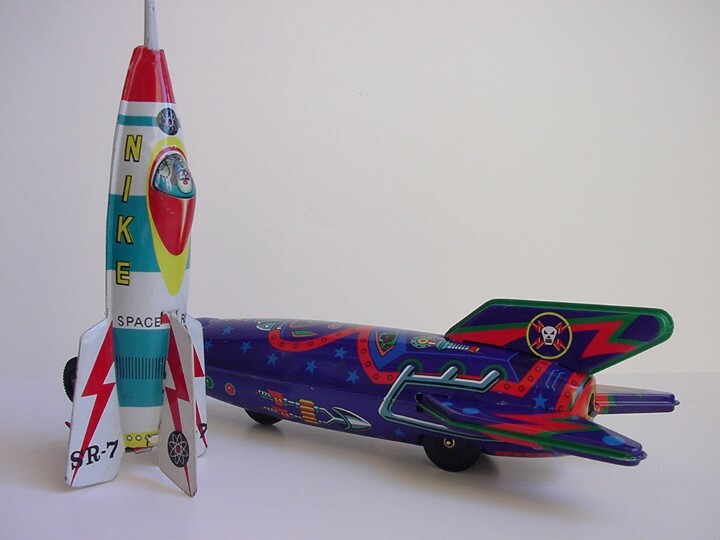 In the 50's and early 60's, the Japanese had flooded the market with many appealingly designed tin toys and a large percentage of them were aimed at the USA with items familiar to Americans. 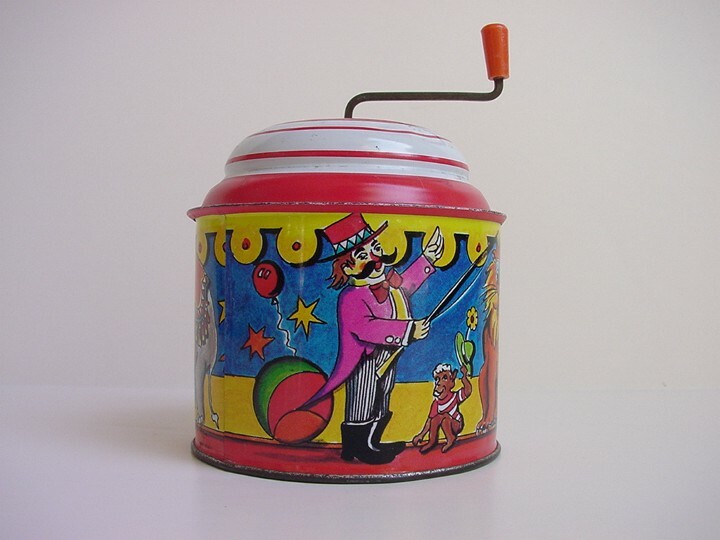 But despite the initial resurgence of tin toy popularity in the post-war era, tin toy manufacturing was faced with steadily increasing difficulties. They included changing consumer demands, new safety regulations and competition from plastic toy makers. 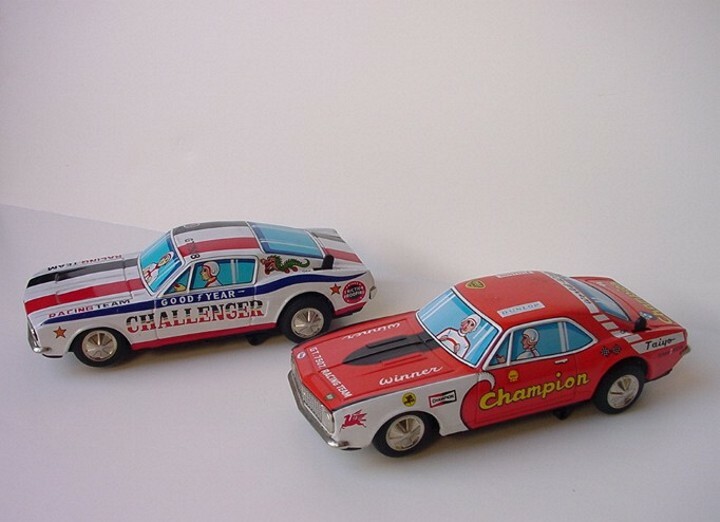 By the 70's, Japan had reduced the tin toy output so dramatically that many factories had ceased production altogether. 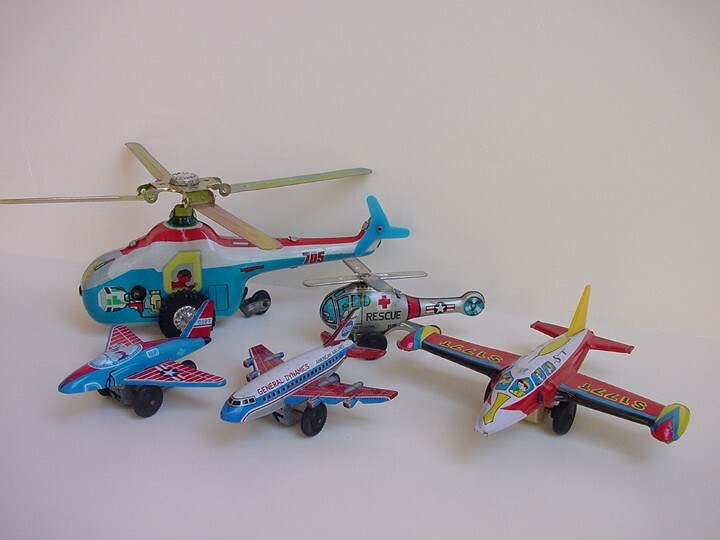 China began to produce tin toys in the early 20's. They were primitive and poorly made. 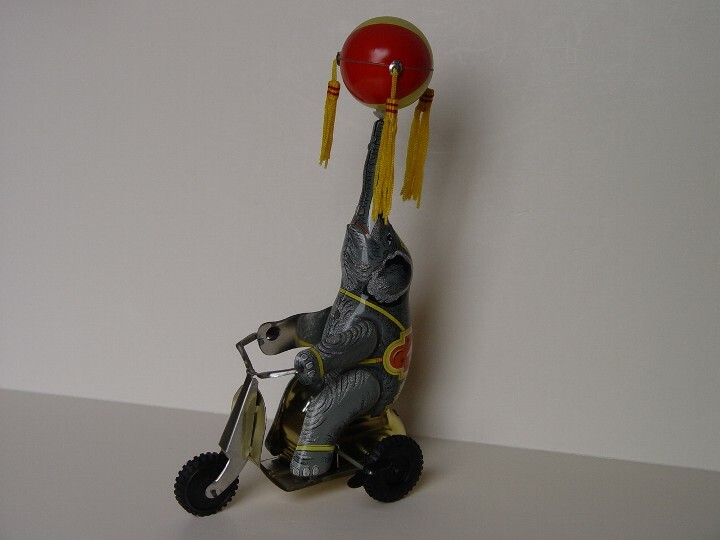 After Japanese tin toy manufacturing was in decline, China assumed the role of the leading tin toy maker in the world. Early Chinese toys were noted for their cheap prices, which often reflected in their quality. Nowadays they are made to a much higher standard, yet retain the edge of being very affordable.